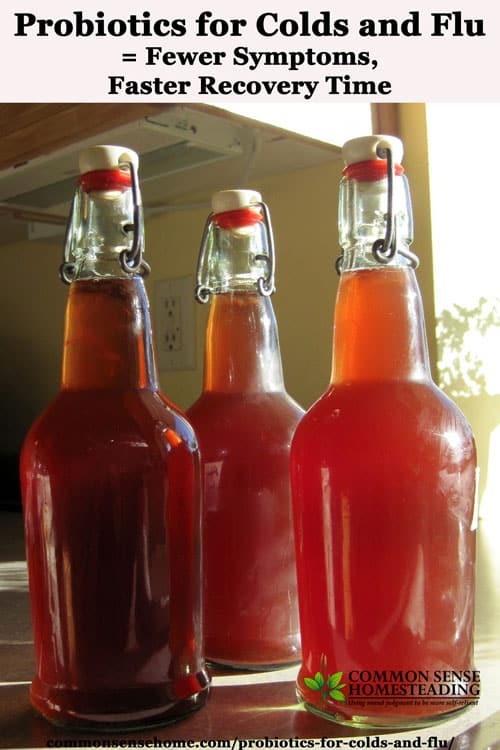 Homemade kombucha may help boost your immune system. Do probiotics for colds and flu really help? Let's check it out. Do probiotics for colds and flu really help? After an 18 month study that examined the effect of probiotics Lactobacillus acidophilus and Bifidobacterium animalis on children aged 3 to 5 showed fewer symptoms, faster recovery time and less antibiotic use. 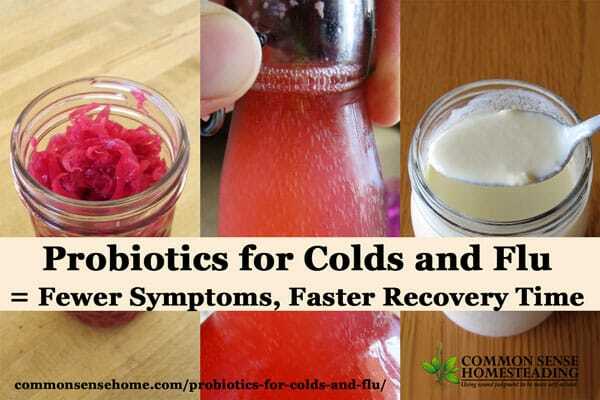 Probiotic-containing foods like kefir are essential during cold and flu season for preventing offending molecules from entering the bloodstream and creating reactions that can cause symptoms of ill health. South Africa-based Ingrid van Heerden, D.Sc, “DietDoc” for www.health24.com, says that probiotic containing foods like kefir are important for maintaining a strong natural defense system because they stimulate the production of immunoglobulin in the intestines, which improves the body's immune response. A recent survey of kombucha drinkers indicated that 82% felt they had increased resistance to cold and flu. Click here to learn how to brew kombucha. If you consider how much surface area there is in the digestive track (some estimates calculate that it forms up to 70% of the immune system), it makes sense that keeping it healthy helps keep you healthy. Can I make probiotics at home? I tried beet kvass, but no one would drink it except for me. Any naturally fermented product (live culture food) that is not heat treated (pasteurized) can introduce good bacteria into your body. The post “Water Kefir Versus Kombucha” identifies the probiotics typically found in water kefir and kombucha. Homemade kraut, water kefir and milk kefir may all help boost your immune system. If you purchase probiotics, make sure you look for live and active cultures. Read the label – you want good bacteria that are still frisky. Watch out for brands that are full of sugar and/or artificial ingredients. These work against your body’s ability to heal. Fermenting at home can provide healthy foods for pennies on the dollar compared to store products. You can also “sneak” probiotics in for fussy eaters by making snacks such as probiotic smoothies. Probiotics are not a “magic bullet” and there is no guarantee that you won't get sick. Adding live culture food to your diet is just one thing you can do to make your body more friendly to good microbes and less friendly to bad microbes. Remember to always contact a trained health care provider in case of serious illness. It takes time to build up the numbers of protective organisms in your digestive track. For best results, start taking live culture foods before cold and flu season gets into full swing. If you want to know more about live culture foods, check out The Complete Idiot's Guide to Fermenting Foods. First published in 2014, updated in 2016. This is a great post! I will be sure to share it! I have many Scoby mothers to give away if anyone is interested. I've really been interested in trying the water kefir. Jeanette – I prefer kombucha, but my kids like water kefir better. It tends to have a milder flavor. I am definitely more of a water kefir person myself, but the hibiscus kombucha sounds pretty tempting indeed! I stopped over from Fat Tues! The hibiscus kombucha sounds yummy! I've been making kombucha and yogurt. Almost all 7 of us eat some type of probiotic food daily. We've had a few colds come through the family this fall, and almost all of it was pretty minor. Now I'll go drink my kombucha! What a great post…I cannot tell you how many things I just learned from reading this. Treasures Evermore – be sure to stop in next weekend for the next installment. Jill – I always enjoy Fat Tuesday. Lots of great links. Your great post was featured at my Sunday Snippets this week. Come and check it out!